In the example above, a living area had been illuminated by two dual-fluorescent lamps, consuming about 160 Watts of power. This produced a harsh, white light that reflected much of its output on the walls, which was quite overbearing for a living space. The lamps were then replaced by four 12 Watt LED lamps with a 90º spread, consuming only one quarter of the power. This produced a pleasant warm-white illumination over the seating area, much more suitable for this situation. Also, the LED lights eliminated the two seconds of the usual flickering that occurs whenever fluorescent lamps are first activated. The left image shows two 11 Watt compact fluorescent down-lights being used to illuminate a dining table. (these were the cheap down-light substitutes available from supermarkets) The complaint here was that the lamps were quite dim for meal times, also they took a full ten minutes to reach full intensity, so they had to be activated well before they were needed. The right image shows where they have been replaced by two 12 Watt LED lamps with a tight 30º spread. This ensured excellent light for mealtimes, without saturating the room with excessive illumination. This is not a direct comparison because the original situation (left) had only four 50W down lights, which was deemed to be insufficient for the large area. They were replaced with seven 12W LED lamps, which still consumes less than half of the previous power, with a much brighter result. It is worthwhile noting the effect of the changed lighting on the far walls. 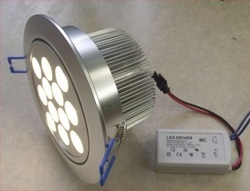 In the above lighting examples, the LED lamps used were 12 x 1-Watt LED devices, as shown in the adjacent image. These lamps snap into a 110mm hole and have an integral AC transformer/regulator and a useful swivel feature to direct the light where needed. Apart from big differences in energy efficiency, both LED lights and the earlier Halogen lamps have a lighting angle for their illumination. Typically this was 55º for the Halogen lamps. 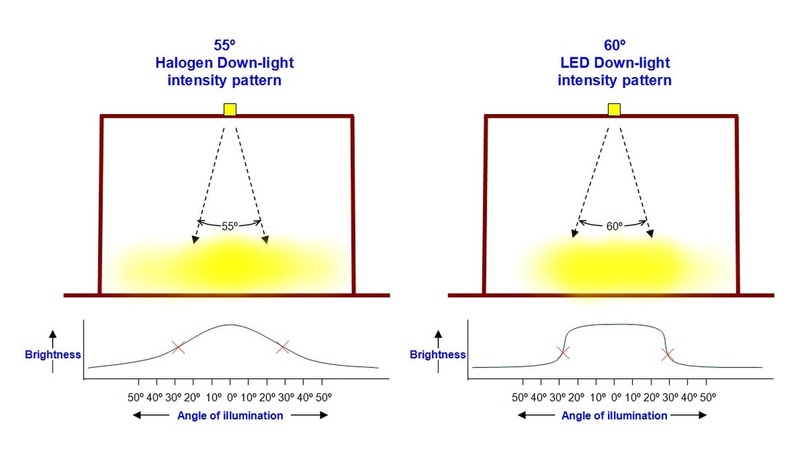 LED lamps may be sourced at a variety of light angles from 30 to 120º, although 60º and 90º are the most common. It is important to know that there are further differences between the two lighting types that affect how they look in a room. The Halogen lamps disperse light over a wide range that varies in intensity. This intensity falls as the angle from the centre of the beam increases. A 55º lamp only marks the points where the intensity has fallen to half of its peak brightness, hence there is still some illumination outside the 55º area. LED lamps have a sharper cutoff at their working angle. So when purchasing LED lamps be aware that if peripheral Halogen lighting had been shining on a nearby wall, that an LED lamp of equal or greater intensity may appear dimmer outside of its target area. This is related to the physical makeup of the different lamp types. The diagram below highlights this effect. Often the differences are small and subjective, but it is useful to be aware of this effect. In general, most people will enjoy the very even illumination of the LED lamp on the target area and prefer it to the older Halogen lamps. For most domestic situations LED lamps with a 60º to 90º angle will provide satisfactory results. Regarding intensity, some reasonable comparisons can be made. 50 Watt Halogen lamps were very common, but in recent times these have been withdrawn from the Australian market in an attempt to minimise the fire risk of the high-power lamps and only 35 Watt lamps can now be purchased. This has been responsible for many living areas to be under-illuminated. * LED lamps of 8 Watts or less are generally disappointing as a replacement for existing lighting. * A 9 Watt led lamp fitting will be 10-20% brighter than a 35W Halogen and about 95-100% of a 50W Halogen lamp. * A 12 Watt LED lamp fitting will be about 10-15% brighter than a 50 Watt Halogen lamp. * A 4 x 3 Watt (12 Watt) LED fitting will be compact, easy to retro-fit and produce the same light as a larger 12 x 1 Watt fitting, but the larger 12 x 1 Watt lamp will not appear so intense to the eye when looking up towards the ceiling. These statements are the best guide to decide what is most appropriate for a room when selecting lamp types. If the number of fittings already in a room is limited, then changing to 12 Watt lamps can lift the look of a room quite nicely. If there are already lots of lamps in a room, then replacing them with 9W units is usually sufficient. Use Warm White lamps (3000K) for most situations as they are a softer, more pleasing illumination resembling sunlight. Cool White lamps (6000K) are more similar to fluorescent lighting in colour and are a good choice in kitchen and working areas. WHITE OR SILVER FRONT LAMPS? Whether White or Silver painted LED lamp fittings are chosen is also subjective. White lamps on a white ceiling may seem to be the best choice and will blend into the roof colour when they are turned off, however, many people like the look of the silver front lamps in their living space. Those who have swapped white-face Halogen lamps for silver-face LED lamps in their living space have usually been pleased with their selection.